Research In Motion’s (RIM) latest addition to its smartphone line, the BlackBerry Tour 9630, is a “world phone,” meaning that it’s built to operate on both CDMA networks–like Bell and Telus’–as well as networks that use GSM technology, like Rogers’ network. However, both Bell Mobility and Telus, the two exclusive Tour carriers in Canada, “lock” their branded Tours so you can’t use them on rival networks. Luckily, there are two simple ways to “unlock” BlackBerry Tours so they can be used on GSM, as well as any other compatible networks across the globe. The Tour’s a dual-band, 3G CDMA device (800/1900 MHz, EVDO Rev A), and it supports both quad-band GSM/GPRS/EDGE (850/900/1800/1900MHz) and single-band, 3G UMTS/HSPA (2100MHz). Unfortunately, you’re out of luck if you want to use your unlocked Tour on GSM 3G in the United States; neither T-Mobile nor AT&T employ the 2100Mhz frequency for U.S. 3G, even though T-Mobile licenses some of the spectrum and could potentially use it. So your Tour will be stuck on 2.5G EDGE if you decide to unlock and go the GSM-route–at least in the States. Note: Any locked BlackBerry can be unlocked, but the process can be very different, depending on your device, carrier, etc. 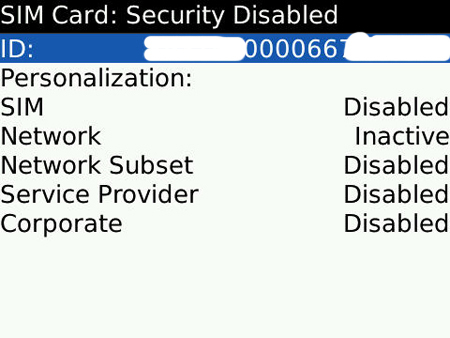 The following instructions are specifically for RIM’s BlackBerry Tour 9630. I used the first method described below to unlock my Verizon 9630. One simple and reliable way to unlock your BlackBerry Tour is through a third-party “unlocker” like CellUnlock.Net, HorizonWireless.com or Cellfservices.com. Generally, the newer the device you’re trying to unlock, the more expensive the unlock code. 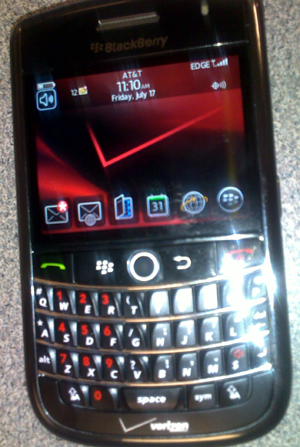 Since the Tour is still brand new–it was released by both Verizon and Sprint on July 12–it’s usually a bit more expensive to unlock than, say, Bell’s BlackBerry 8830 World Edition device. Currently, Cellunlock.net’s charging $34.99 for a Tour unlock code while CellfServices.com is running a Tour unlock special for $21.99. You may also want to enter CrackBerry.com’s free Tour unlock code contest, though you better act fast. It ends this weekend. To locate your IMEI number, check the side of the box your BlackBerry came in. The IMEI will be listed amid a number of bar codes and other product information. If you don’t have your BlackBerry box, or would rather not have to dig it up, simply access your BlackBerry Help Me! screen, which lists the IMEI, using the following keyboard shortcut: ALT + Left Shift + H.
1) Ensure there’s a SIM card in your device. The card can be the one you wish to employ or any other SIM. 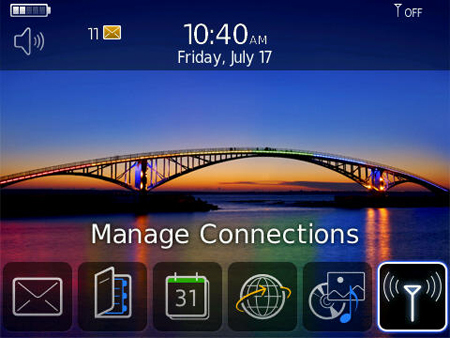 2) Turn off all wireless connections via your BlackBerry Manage Connections icon. 4) On the SIM Card screen, type the letters M, E, P, D. You’ll see your display flash briefly, and a new screen with information like ID, Personalization, SIM, Network, etc., appears. 5) Next, type M, E, P, 2, and a dialogue box requesting a network code appears. Enter in your unlock code, click your trackball to confirm it, and voila, your Tour’s unlocked. Now, for the free option…..
Perhaps the easiest way to unlock your BlackBerry Tour is through your original service provider–assuming you purchased the device through one of the carriers and have a current service plan. The best thing about this option? It’s free. I can’t vouch for Sprint, but I’ve talked with a number of Verizon customers who’ve successfully unlocked BlackBerrys for free by simply calling up the carrier and asking for an unlock. Okay, it’s not exactly that simple…but it’s close. The Tour, and any other BlackBerry World Edition device, is meant for use on both CDMA and GSM networks; however, the carriers that sell the devices want you pay it or its partners for international data and roaming, instead of using another carrier’s network altogether. Carriers do everything they can to dissuade you from using another carrier, and that means it may not be quick to unlock your device if it suspects you’re going to use it on another network. Verizon will reportedly unlock your BlackBerry Tour for free if you call and ask, but you’ll be wise not to mention that you plan to use it on another carrier. When you call Verizon to request an unlock, or visit a local retail store, explain that you want to use your device overseas, but are unsure of where exactly and want to hold off on adding global data to your plan. It should be that simple. Still, I found someone yesterday who asked Verizon to unlock his BlackBerry 8830, but the carrier refused, unless he came to a store and talked with a representative. He had recently purchased and activated the device, so Verizon was apparently suspicious since he hadn’t been using the BlackBerry on Verizon for long at all before requesting an unlock. If everything goes as planned and your carrier doesn’t impeded your unlocking, remember to insert the SIM card you wish to use into your device. Then open up your Manage Connections options.